Drivers using Bluetooth car kits are now able to operate their handsfree device from steering wheel controls with new gadgetry from Parrot . Bluetooth car-kit specialist Parrot has introduced two new conversion kits for its installed Bluetooth set-ups that allow finger-tip operation linked to steering wheel controls. The Parrot Multicomm and Parrot Multican kits are now available for the Parrot CK3000 Evolution and Parrot CK3100 LCD Bluetooth handsfree kits. The Multicomm and Multican systems cost from £59.99. The kits are designed to make mobile calling while driving with Bluetooth safer, by integrating with a vehicle's existing steering wheel controls. 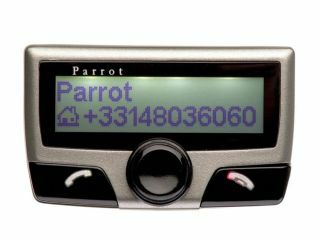 Parrot Bluetooth car kits are compatible with virtually all current Bluetooth-enabled mobile phones.